I drove up to the film set of ‘Monster Man’ in the Mercedes A180, a film I play a pretty rough Maori fella in. Not quite the picture you get of a driver of this refined, elegant little vehicle is it? Gumboots, unshaven with a Swanndri and beanie: quite the contrast to this 90kW, 200Nm 0-100 in 8.6 seconds, 5.8 litre athletic performer. However, I got the chance to drop gumboot on the accelerator all the way to the Hurunui and found it a pleasure to drive. It’s a looker – like me, right! 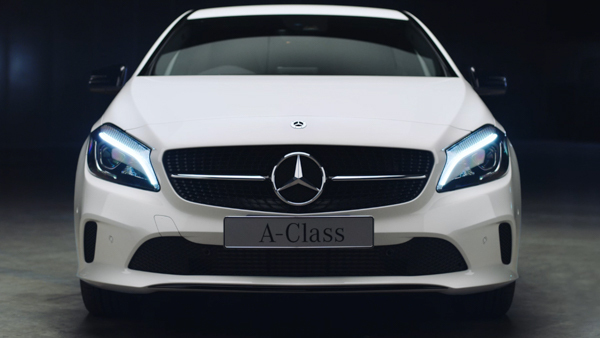 – with all the style you expect from Mercedes. A relatively affordable price, with entry level at $47,900. It’s a hatchback, but you wouldn’t know that from the front with its sleek grille. It was great on fuel consumption and even though I’m not a great fan of column shift, most other features make it a good all-rounder. There’s room for school bags, groceries – and real estate signs! The sunroof gives an open cabin feeling and the black and silver interior creates a nice clean feel. Exterior lines and profile are nice too. Things that get the tick? Sunroof, automatic tension adjusting seatbelts, interior, dash interaction, steering and acceleration controls, refined interior and iPad style display. It has its place in the Mercedes fleet: it’s a sporty number for around town and I liked the open road performance. Talk to the team at Armstrong Prestige about a test drive. If you’re after comfort, sportiness and safety features, you’re not wasting your time.